Trying to figure out what to do in 2016? If you aren’t coming along with me on one of my 11 Big Year Tours (more info at bigyeartours.com), then why not join me to see one of the natural wonders of the world–the Amazon River! I will be going with Wildside Nature Tours March 12-20, 2016. Besides me, this boat has photographer/birder Kevin Loughlin, South American birding guru, Edison Buenaño, author/birder Scott Weidensaul, naturalist Amy Weidensaul, and local naturalists. Tour information can be found here. 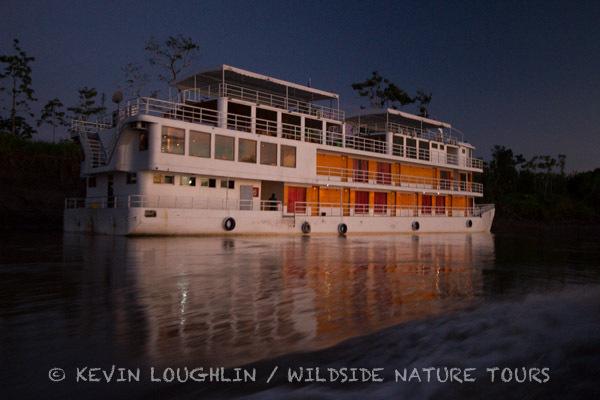 Our lodging will be one of the best looking riverboats on the Amazon. We’ll have comfortable rooms, a dining area, and smaller boats that will make side trips. We’ll be exploring one of the world’s most diverse ecosystems including the wildlife-rich Pacaya-Samaria National Reserve. This will be a trip of a lifetime! Here is a trip list of birds (as submitted to eBird) for Wildside’s Amazon Riverboat Cruise in 2015 with Kenn & Kimberly Kaufman.